The entrance into spring has been a bit of a blur. This is the fourth final season for the Wombats collection. You gotta catch 'em all! On Thursday I welcomed spring with this Chronique -- or as I like to call it Bubonique Chronique -- from Le Trèfle Noir. 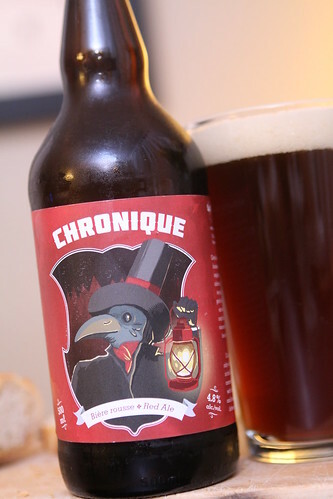 The Quebecois breweries seem to be fascinated with the red (or rousse) style. Every brewery seems to make a version of this beer and it is far more popular than it is in the States. This one was pretty good and extraordinarily flavorful for a mere 4.8% ABV. Last night I got caught up at work then caught up in traffic. This resulted in me arriving at day care exactly three minutes before they closed and thus avoiding the astronomical cash fines levied when one arrives late. So far we have never had to pay the late fees and I'm hoping it remains that way. After paying what we have been paying for day care it hardly seems fair that they'd ever be able to charge us more. 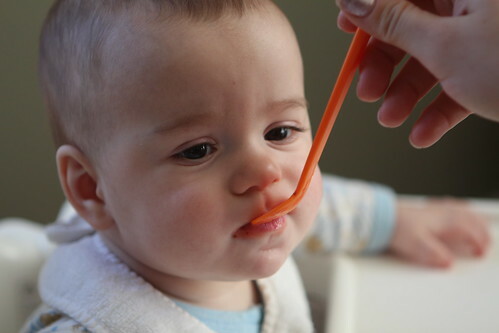 In fact, I have long held that they should follow us home after we pick the babies up and do some light chores around the house including all of our dishes and cleaning the babies' rooms. 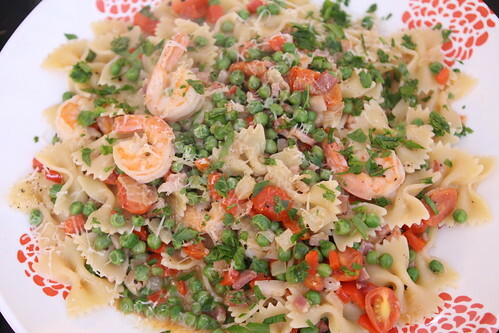 After getting the babies to bed I continued the spring theme with this farfalle with bacon, olive oil, butter, peas, onion, red pepper, bacon, shrimp, and parsley with a little Parmigiano-Reggiano. The only reason I didn't add garlic is because, for the first time ever, we seemed to be out. 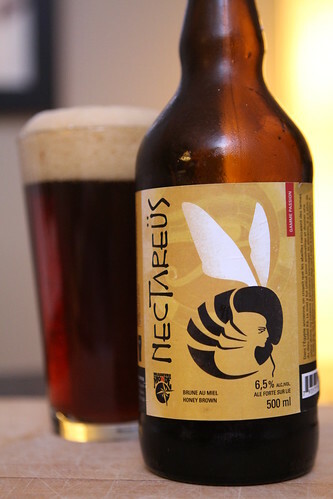 To ring in spring with an appropriate beer I selected this Necatreus honey brown ale from Brasseurs du Monde. This was a fantastic beer albeit a little too sweet to have before dinner. I'd definitely recommend it as the end of a meal moreso than an accompaniment. Still I'd rank this among the top honey brown ales I've ever had. While originally purchased because of the badass bee on the label I was pleasantly surprised by the quality of the beer inside the bottle. 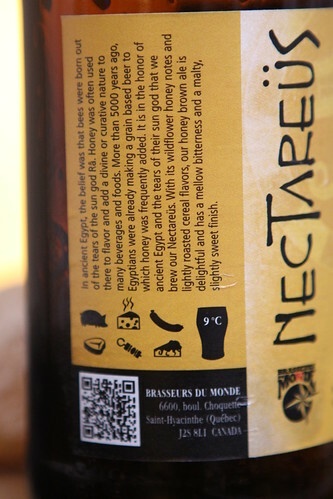 One thing this series from Braseurs du Monde does is put a nice key on the back to show you what the beer pairs well with. This one apparently goes great with smelly cheeses and cartoon-style hot dogs. For breakfast this morning we gave the guys their first taste of fresh strawberries. The initial bites didn't seem to go over well but once they got rocking they loved it. 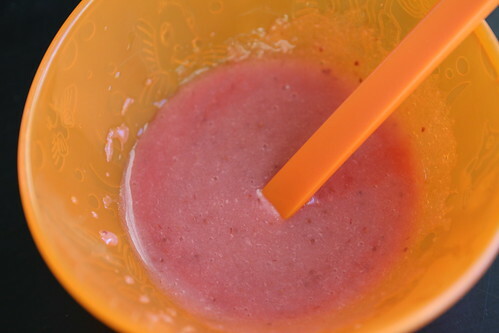 In order to stretch the berries I added a little milk and oatmeal to them. Hours later they still smell like strawberries, a phenomenon that hasn't really occurred with any other foods we've given them. I'm pleased that broccoli doesn't have this same effect. 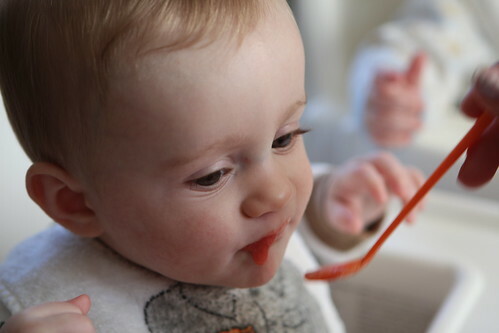 There's a huge incentive to getting them to bed for their nap. 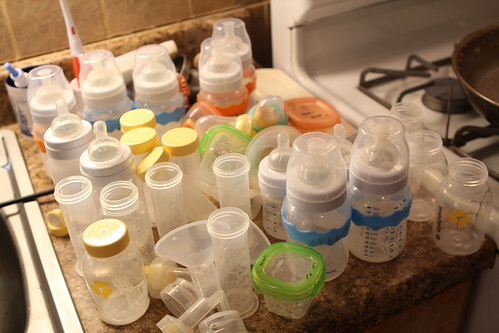 Once they are both asleep then you can enjoy a little time to yourself doing some hobbies that you really enjoy such as washing a mere day's worth of baby supplies. I love a little me time.